This is our new "Build Your Own" Gamechanger Piston Pro Pack. Now you are able to build your own Pro Pack with the pistons you prefer! We are also offeing this Pro Pack a little differently than in the past. 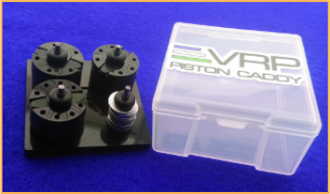 You are basically purchasing two 2 sets of Pistons along with a Piston Caddy, and getting the 3rd set of Pistons FREE! another ‘system’ into a small part like a piston. speed and reacts as needed.